Chris Eubank Jr. is predicting a victory for George Groves (26-3, 19 KOs) over his Ali Trophy quarter-final opponent Jamie Cox (24-0, 13 KOs) on Saturday at The SSE Arena, Wembley in London. Eubank Jr. earned his spot in the semi-final of the World Boxing Super Series when he dominated and knocked out Turkish Avni Yildirim in round three in Stuttgart last weekend. A superb performance that paved the way for a potential semi-final clash with former sparring partner George Groves. “After my performance against Yildirim, it’s hard to see anyone as the tournament’s favourite apart from me. I can beat everybody in the super middleweight division. 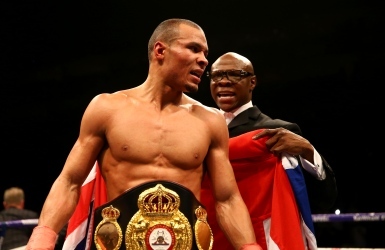 Anyplace, anywhere, anytime,” said Eubank Jr. before predicting the outcome of Saturday’s all British match-up. “Nothing is certain, anything can happen in boxing, but I want George Groves to win. We have a history and this is the fight the public has demanded for many years, so hopefully he gets through the fight and then we can get in the ring in January. “I am not a betting man, but if I had to put money on one I’d say George because of his experience. Cox is unknown, he is green. I’ll give George the edge of the fight. Tickets for the quarter-final clash Groves vs. Cox on Saturday in London are on sale ranging from £35 to £130 at axs.com.